A car driver has been killed and five train passengers injured in an accident on a level crossing in East Yorkshire. British Transport Police said the Doncaster to Scarborough service hit the car on the crossing close to the village of Rawcliffe Bridge near Goole. The two-carriage Northern Rail service left Doncaster at 1756 BST. The accident happened 30 minutes later. Steve Henry, from Humberside Fire and Rescue, said another train had taken the two slightly injured people and the rest of the passengers back to Doncaster. He added that the three taken to hospital by ambulance are thought to have spinal injuries. The accident happened when the car was on an unmanned level crossing near Rawcliffe Bridge which is a small village in a remote area. 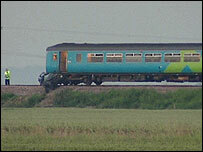 The train dragged the car about 100 yards up the track towards Goole before coming to a halt. It was not derailed. British Transport Police Chief Inspector Jane Kitchen said the crossing was of a type where the gates had to be opened by car drivers. She said the gates were open and apparently not damaged and checks were continuing to see whether any of the equipment had malfunctioned. Ms Kitchen said: "It's a gated crossing and it does have a set of lights to indicate when a train is coming. "We are in the process of checking with engineers whether or not we can tell if they were working at the time but at the moment we are still investigating and we are totally open minded about the cause of the accident." She said the train, which was carrying about a dozen passengers, was travelling at "normal line speed". Network Rail has brought heavy lifting equipment to the area to help clear the track. The incident is understood to have happened only about eight miles from Great Heck, the scene of the Selby rail crash disaster in 2001, in which 10 people were killed. Motorist Gary Hart fell asleep at the wheel of his Land Rover and plunged off the M62 on to the East Coast mainline. A southbound GNER express train collided with his car before being deflected into the path of a fully-laden northbound coal train. Hart, 37, of Strubby, Lincolnshire, was jailed for five years at Leeds Crown Court after being found guilty of causing death by dangerous driving of the 10 victims.